Germany is actively pursuing a switch from fossil fuel to renewables, the so-called Energiewende (energy transition). Due to the fact that the supply of wind and solar energy is less predictable than the supply of fossil fuel, stabilizing the grid has become more challenging. On sunny and windy days the supply in Germany substantially exceeds demand, and the surplus needs to be exported to the neighboring countries. In this study we analyze data from the German day-ahead market in the period 2009 through 2015 and show that the realized day-ahead price experiences significant downward pressure from high predictions for the day-ahead solar and wind supply. This conclusion is based on a regression analysis using the singular value decomposition (SVD) method. SVD decomposes the time series as a sum of data-determined profiles. During the observed period the market share of solar and wind energy in the total energy supply increased in Germany. The larger the market share, the more impact solar and wind energy have. Dorsman, A.B, Khoshrou, A, & Pauwels, E.J.E.M. (2016). 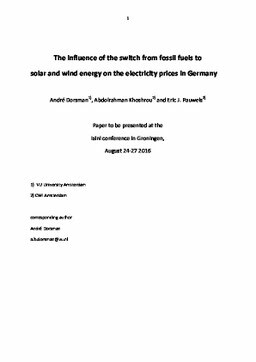 The influence of the switch from fossil fuels to solar and wind energy on the electricity prices in Germany. Presented at the The Conference of the International Society for the Intercommunication of New Ideas.